Here's a look at six pizzerias with interiors that are out of the ordinary, including one filled with terrazzo and another featuring a disco-ball-shaped oven. 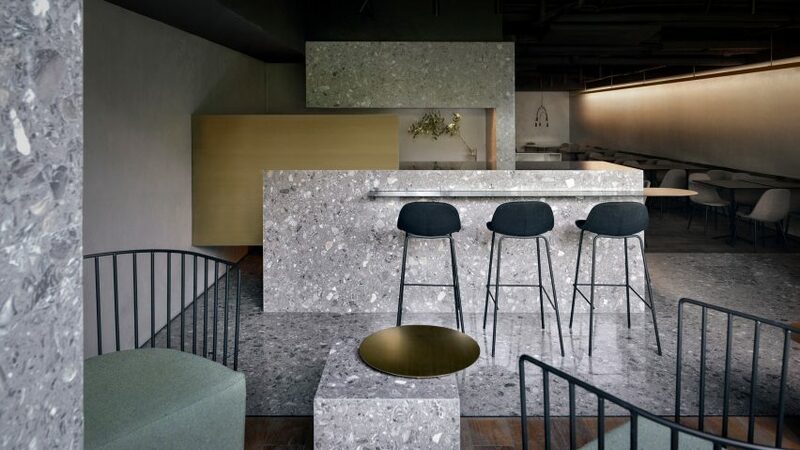 Grey terrazzo dominates in this Beijing pizza restaurant, while other details include lighting and furniture made from black steel and brass. Pale-toned penny rounds cover surfaces inside this pizzeria on New York's Lower East Side. It also contains custom seats and stools with metal stands and green leather upholstery, to evoke a "deco meets industrial" look. An oven shaped like a giant disco ball is the centrepiece of this eatery. When evening falls, the lights are dimmed and coloured spotlights are directed onto the ball, causing pink, green and blue dots to flood across the white walls and ceilings. Colourful tiles form large letters that spell out "pizza" in this London fast-food spot, which is named after a 1988 acid house track. Patterned tiles decorate the floor and a wall in the dining room of Capanna in Athens, which is furnished with vintage tables and chairs. Three-metre-high shipping containers line the walls and integrate shelving displays, cupboards and bathrooms in this warehouse-style pizzeria.